In 1969 photographer Shomei Tomatsu first visited Okinawa- a chain of islands which was then under American military occupation, islands which would be under US rule for another three years. Having grown up near an American base in Nagoya in the societal chaos that marked post-war Japan, Tomatsu wished to further his photographic investigation into the Americanization of his homeland by making a pilgrimage to the base of bases- Okinawa itself, the anchor of American power in the post-war Pacific. Arriving with the notion that Okinawa would naturally have to be more Americanized than other parts of Japan, Tomatsu was all the more struck by his discovery that in fact the people of Okinawa were able to survive with their own originality and intensity. This local intensity- paired with the light and color of the tropics- influenced Tomatsu's shift from black and white photography to color, a move which he later stated was an evolution away from dealing with how he saw Americanization in monochrome, and a new belief that in color, his pictures "first move toward the essence of Japan, but do not stay there. They then leap to the other side of Japan, but the landing site is unseen." First published by Mainichi Newspapers in 1975, the original edition of The Pencil of the Sun has long been recognized as a watershed in the history of Japanese photography. Akaaka's 2015 edition is a gorgeous new presentation of this classic book that is comprised of two volumes, The Pencil of the Sun 1975 and The Pencil of the Sun 2015, enclosed in an acrylic slipcase. The first volume, 1975, is a redesigned edition of Tomatsu's iconic collection of black and white and color, images. It contains all but two pictures from the original edition- however it includes Shomei Tomatsu's original text (in Japanese) from 1975. The second volume, Pencil of the Sun 2015 is a collection of unpublished color images from Tomatsu's travels which richly extends the experience of the 1975 edition. 2015 is the product of the dedication and insight of Professor Toshiharu Ito and Anthropologist Ryuta Imafuku- both of whom provide original critical essays (in Japanese) for this second volume. 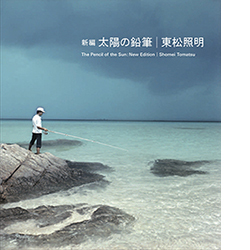 In The Pencil of The Sun: New Edition Photographs, Tomatsu's landing site can be witnessed as one that extends from Okinawa down through islands all throughout the southeast-Asian sunbelt. The result of his peregrination shows inhabited by a vibrant human authenticity in dress, action, and living on the sun-drenched islands he visited. This important body of work continues to be a significant waypoint on the understanding of both the photographic journey of one of the greatest of Japan's post-war photographers, as well as issues of culture, nationalism, and history which still resonate today.